GMO Free NJ welcomes farmers Nate Kleinman and Dusty Hinz, founders of the Experimental Farm Network (EFN) for a special workshop on seed starting and food sovereignty. The EFN, a New Jersey nonprofit organization, is an open network aimed at reversing climate change by collaboratively developing the crops and agricultural systems of the future. The class will start with a community seed exchange; participants are encouraged to bring seeds collected from this past harvest. The practical part of the workshop will focus on proper storage of seeds, seed starting and care of seedlings. Attendees will also hear Nate and Dusty’s thoughts on how seed saving is related to food sovereignty and the movement toward a new paradigm of fair and sustainable agriculture. Find out how current policy issues impact our food choice freedom and learn what you can do about it. Discover how the work done in one’s own garden can help empower communities and create true food justice. A selection of rare seeds from EFN will be available for purchase. Don’t miss this engaging documentary about the health and environmental effects of genetically engineered foods, also known as GMOs. 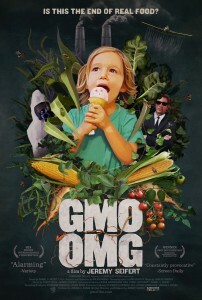 Following the film, speakers from GMO Free NJ will lead a discussion on the issues surrounding GMOs, answer questions and provide an update on the effort to enact a GMO labeling law in NJ. There will be a door prize, so wear your lucky socks! Don’t miss the annual GMO Free NJ holiday celebration. There will be music, conversation and COOKIES! From 6:30-7:00 we will have a holiday cookie exchange. Participation in the cookie swap is optional–bring a batch of your favorite non-GMO cookies to share (along with an ingredients list) and leave with a variety pack! And don’t worry! Even if you don’t bring cookies you may snack on some anyway. From 7-8pm we’ll hatch plans for 2015 and discuss the latest on GMO labeling legislation so bring your ideas for ways to spread awareness across the state of New Jersey and beyond. There will be plenty of time to mix and mingle. Free and open to the public–bring a friend! NEW JERSEY: ALL HANDS ON DECK! It’s time to make our right to know the law in NJ. The Assembly State and Local Government Committee will be holding a vote on GMO labeling this Thursday. We need a strong presence at this vote so our elected officials can see first hand how much people care about knowing what is in the food they are eating. Early meet in the Cafeteria 11:00am. Please try to show up by 12:30pm to make sure you get a seat.